Auction Closed Sold via Buy Now $800. Next Auction Monday July 23. 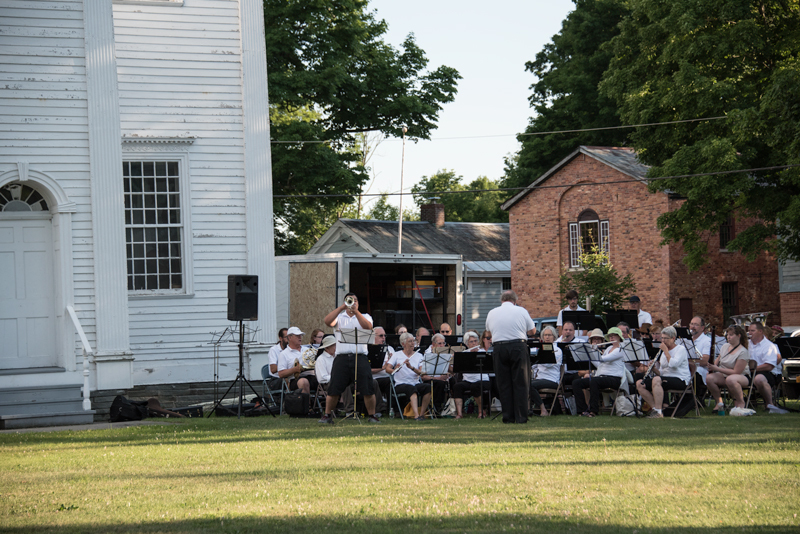 Talented musicians converge on community bandstands and village greens. 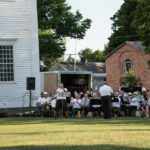 The conductor raises a baton and the Town Band strikes up a tune. 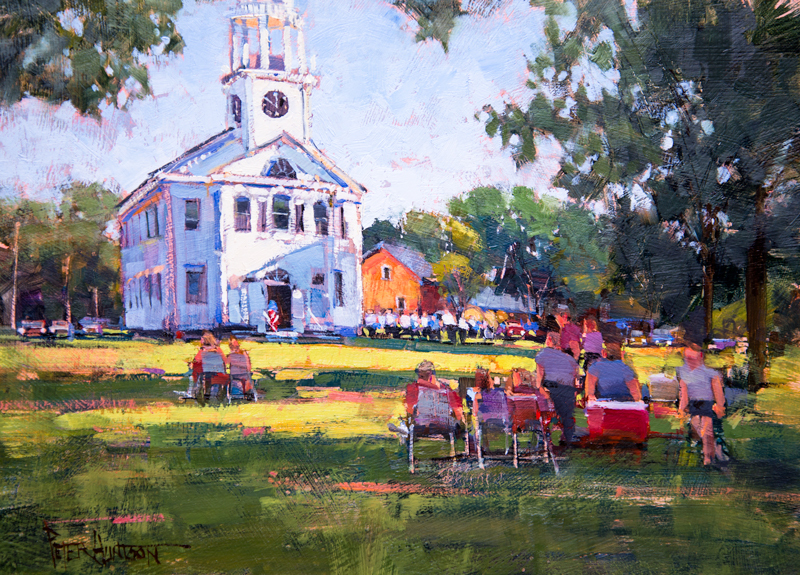 Another Day in Vermont crescendos as the setting sun casts a spotlight and summer shadows across the stage. Don’t you LOVE that you only have to drive 8 miles for suitable inspirations! Isn’t that the truth Noka! I for one, just love this part of small town living! Love the picture, Peter! I’ll second that emotion, Vivian, thanks! Hi Peter, a lovely day and a good concert. What more do you want? I suppose it was like this. Happy summer. We also have sunny days but the plants are suffering. We all need a summer rain. Have a good time, Peter. Greetings from a heated Duisburg. I have seen a few town bands play in Germany on my visits there Doris. I think there may have been more beer involved there. Indeed! In this summer beer is nearly sold out because the bottles don’t return. You know we love beer in bottles of glass. But in the park we also love beer in big “Humpen” or so called “Stiefel” or in Bavaria the like it in “Maß”. Wow! 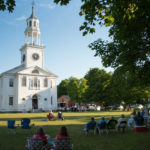 Just had a flood of wonderful memories come back enjoying summer evenings on the green. Thank you Peter for bringing back such a special time. My favorite of your paintings so far! I would really like to sit under one of this trees and listen to the music; a glass of lemonade would be perfect. I love all the pictures you paint. It feels like you are right there. Thank you. Nice talking with you Nan, I’m glad we figured it out! back to the joys of small town America. Thanks! Is this the East Poultney United Baptist Church? The heart of where I grew up. I spent many hours here and have many fond memories. You captured it beautifully! Beautiful painting Peter!! You have captured the Vermont gathering on the Green. One big family!! Love it!! 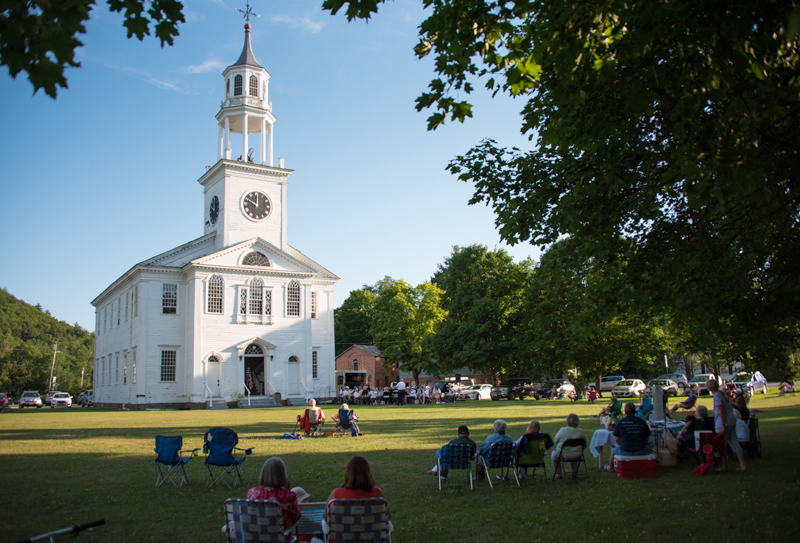 I love summer concerts in villages and small towns. This painting brings back memories. Thanks very much Jan, I am feeling much better. This one is East Poutlney, but close enough to Middletown to hear the closing crescendo.